This blog from Claire and Mark over at Travelpod.com is really excellent -- as well as diary entries from their campervan journey, they've included heaps of great photos that'll make you want to drive down the Queensland coast. "After a deep 10 hour sleep we both wake refreshed and ready to hit the road. The weather is much better today and it is hot and sunny. We leave Lemon Tree Passage and head straight to the supermarket for sun cream and mozzie bite cream - the local wildlife had had a feast on our fresh English blood during the night! Back on the Pacific Highway to Buladelah, we take a turning for Pacific Palms and follow signs to Bluey's Beach. As we drop down the hill, we get our first view of the ocean and the magnificent beach with only a handful of people on it. We can't resist a quick paddle!" ..."We decide to have fish & chips for tea (well to be accurate, Barramundi & Chips - how exotic!) and eat them on a park bench overlooking the water. It takes a lot to beat Yorkshire Fish & Chips but these were good! As we sit enjoying the view, the sun starts to go down..."
Video: A campervan tourist begins his journey. Here's a link to a blog from two travellers who set off from Darwin on a six day journey to get to Alice Springs. "Once we were in Alice we had a walk around the town centre, went on the internet (obviously a very exciting activity when you haven't been on facebook for a whole 6 days) and nipped to tourist information to find a campsite. We found a campsite called Good day mate on the outskirts of Alice which was very nice, we read our books when we arrived here, Daisy and I painted our toe nails and then we decided we should really cook tea." 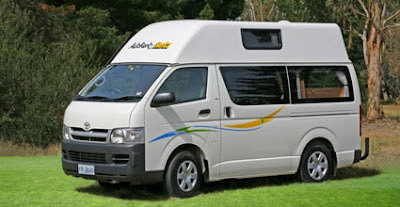 Here are a great couple of links -- the first is a blog entry from a couple travelling through Tasmania in a campervan. The second one is a YouTube clip from a keen filmmaker in Tasmania, who takes in Port Arthur, a former convict settlement located on the Tasman peninsula to the southeast of Hobart. Nowadays the buildings, some of which were built by convicts, are a big tourist attraction. Saturday: This day was a whirlwind, as we had a lot to see before catching our flight home. We awoke early and headed to Mt. Field National Park, outside of Hobart. We were a well oiled machine at this point. We parked and walked to Russell Falls and Horseshoe Falls. You could tell we were a bit closer to civilization, as every stop got a little more crowded. We spent a satisfying amount of time viewing the falls and head back to the van. I wanted to see Salamanca Market, which is a street market in Hobart that is only open until 3pm on Saturdays. Jim got us there with about an hour until close. We browsed and ate sausages. Video: Great videos from a 10-day Tasmania campervan trip. What'll it be Wellington? Woodlands, Campervans or both? Further to our story here about the possibility of a Campervan Park on Wellington's Waterfront, Stuff.co.nz has published a story about some of the submissions the Wellington City Council received. "Forget about $400,000 designer dunnies and more buildings on the waterfront – the area should instead become a "recreational forest" criss-crossed with rollerskating paths and tree-top viewing platforms. That suggestion is among more than 60 submissions received by Wellington City Council on its draft Waterfront Development Plan. The plan recommends the temporary installation of an ice-skating rink on Queens Wharf, a tent-like centre for indoor soccer between Waitangi Park and Te Papa, and a campervan park opposite Whitmore St.
Travelling New Zealand’s South Island by camper van has a lot going for it – but according to one travel writer, tea stops are the best of all. "As a spectacular scene of towering, snow-capped mountains surrounded by an electric-blue glacial lake unfolded before us, we did what any self-respecting Brits would do: we pulled over for a cuppa. Video: Footage of surfing from team Body Glove's 2007 trip to New Zealand. 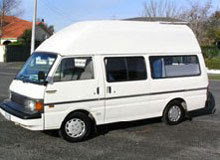 Starting in Christchurch, they drove up to Raglan in 10 days, staying in a campervan the whole way. Watch where you camp -- travellers are being fined for camping in Darwin parks to avoid paying accommodation fees, according to Darwin City Council. A council spokesman told website Thumbrella backpackers and campervanners have been using parks as campgrounds and leaving the area polluted. “There’s not just the issue of rubbish, it’s ablutions as well. It’s a tropical area so you don’t want people defacating in it,” the spokesman said. While some backpackers have been fined, others are moved on without hassle, but the spokesman said they are shortly replaced by another group of campers. Some advice -- stick to the rules and remember when you're travelling you're essentially a guest in someone else's home. 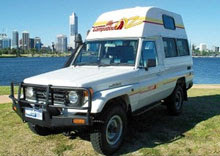 Video: Meet My Campervan -- this campervan journeyed from Melbourne to Darwin over 20 days.